We sat around the thick wooden dining table after sunset in Avignon. The sky was still deep blue, slowly turning black, reflecting the colors of a mood ring. We’d made dinner for our hosts – as we like to do when we play the role of overnight guest. Stuffed tomatoes and zucchinis (courgettes), a reminder that summer was quickly on its way, and a salad as a starter. 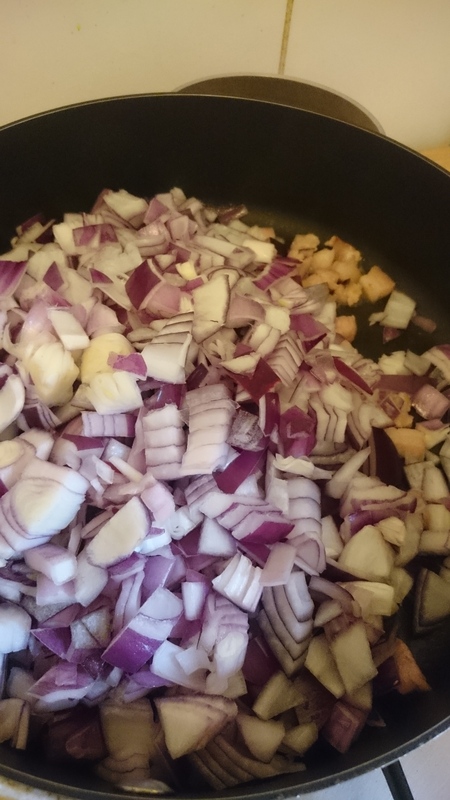 “Wait a second, don’t you have a red onion dish that you make?” my partner in crime interjected. Michel smiled and nodded, pleased that his good friend’s eldest son remembered the recipe, one of his potluck staples. I remembered, too – I’d already heard about the red onion tart during family dinner discussions of summertime get-togethers with the friends from Avignon. Michel told us the story of having been invited to a conference in Spain that he didn’t want to attend. The conference booklet had included the dinner menus for each evening. 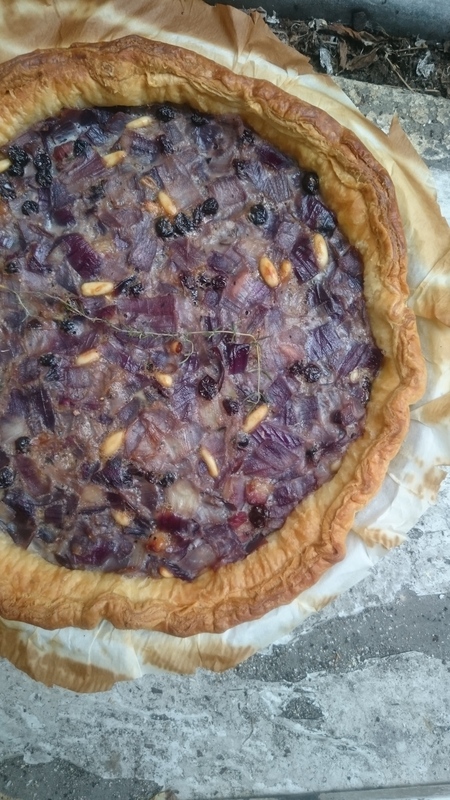 One night, the group was to eat a “Catalane onion tart,” and Michel, curious about what such a tart would possibly taste like, decided to make it up himself. “Wasn’t there some crème fraîche too? Or shredded swiss cheese?” asked Michael, testing his childhood memory. “Do you put lardons?” I asked, inquisitively. Michel beamed in telling us that he’d made the tart for a neighborhood association dinner, and minutes after having laid it down on the table, it had disappeared. After dinner and before bed, I scribbled down my notes about the tart and vowed to recreate it, myself. Like a game of Telephone, I give you the Catalan onion tart, and invite you to make yet another version, if you please. Serves 6 as a light dinner main with a salad, or more as a happy hour snack. Start by sautéing the lardons until lightly browned and crispy, about 2 minutes. 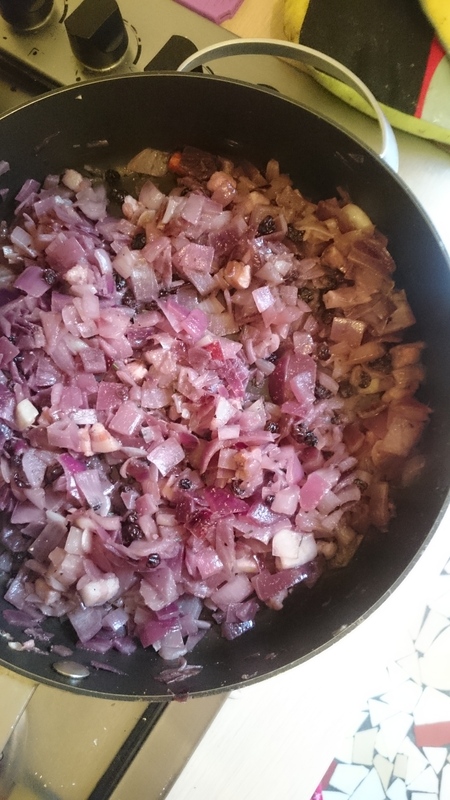 Add a splash (about 1-2 Tablespoons) of olive oil, the onions, and the cinnamon stick and sauté over medium to medium low heat stirring occasionally, until onions are soft and sweaty, about 8-12 minutes. Add the thyme and red wine, stir well to incorporate, and continue to cook until all the wine has evaporated. Taking off the heat, add the raisins and allow to cool. While the onions cool, heat oven to 190C/375F. Blind bake the crust with pie weights (or a bunch of beans that have been collecting dust in the back of the cupboard…) for 12 minutes, remove weights/beans and continue to blind bake for 3-4 minutes until golden brown. In a large mixing bowl, whisk together the eggs, season with salt and pepper. Discard the cinnamon stick and add the onions to the egg mixture, along with the breadcrumbs and toasted pine nuts, and mix well. 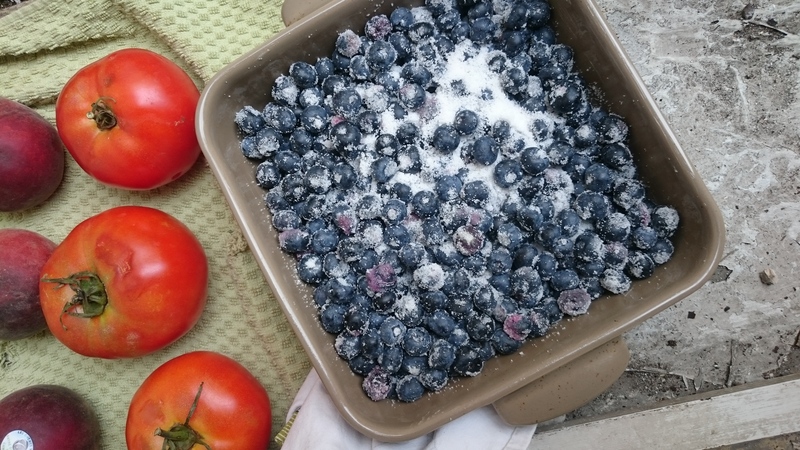 Pour the mixture into the piecrust and bake for 28 minutes, turning halfway to ensure an evenly browned crust. Serve lukewarm or at room temperature, with a glass of red wine. Note: Corinthe raisins are small, black raisins and they work perfectly in this tart because they are about the same size as the pine nuts. 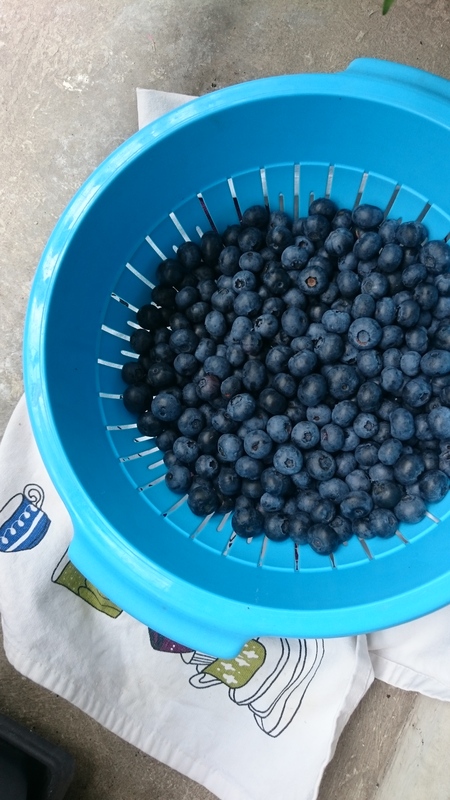 If you can’t find them, regular black raisins would work, too. A backyard barbecue for a hundred was in order to celebrate my Aunt and Uncle’s nuptials, in their backyard in Virginia, early last month. 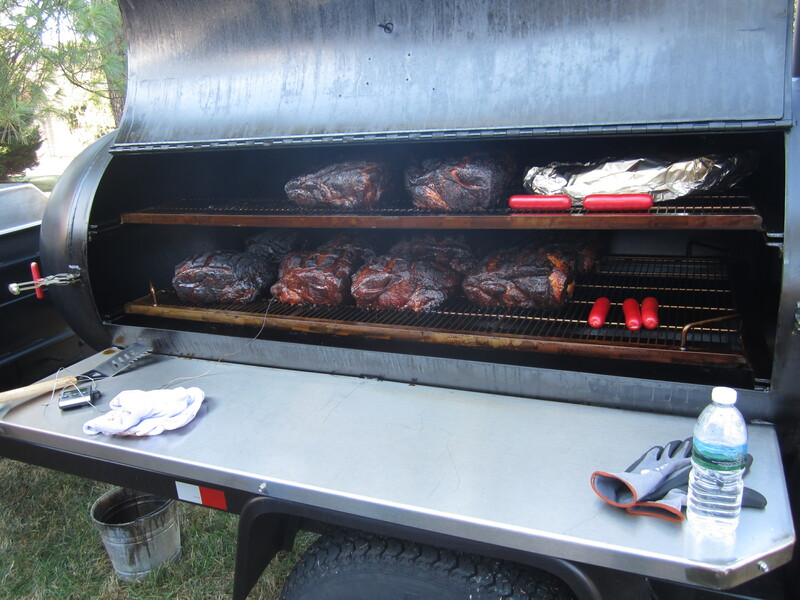 Friends who cater on the side were called in to prepare slow-smoked pork shoulder, “Carolina coleslaw,” baked beans, and hush puppies – which are a corn-based fritter, filled with seasonings and herbs like onions and parsley. 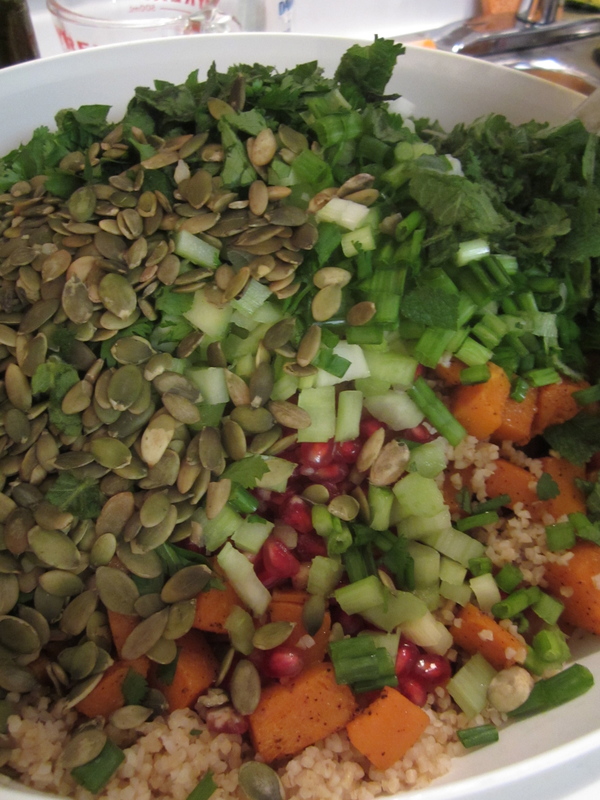 My contribution was to make an enormous salad bowl of what I like to call “autumn tabbouleh” and can fluctuate depending on the vegetables and seasoning available. This dish is one of my weekly staples this time of year, especially for bagged lunches to the office. What follows is more a loose method than an actual recipe – many variations are possible, seasonally and tastefully. 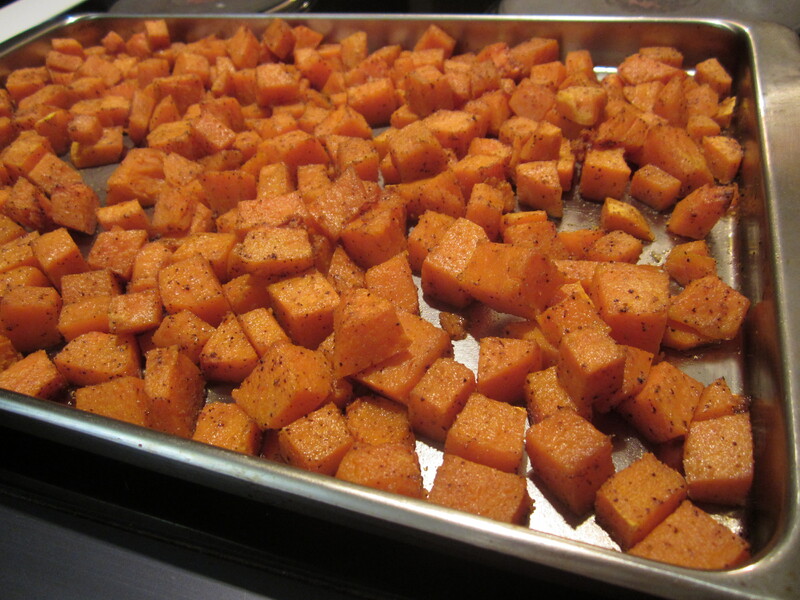 Here I used a whole butternut squash, peeled, cut into half-inch cubes, and tossed in about 1.5 Tbs olive oil, salt, pepper, and cumin. You could sprinkle chipotle pepper, ground coriander, a dash of cinnamon, nutmeg, ground ginger, the list goes on… The squash was roasted at about 180C/350F for 20-30 minutes. You want it to get tender without getting too mushy or browned. There are also four roasted beets – rinsed and wrapped in foil, cook them at 180C/350F for an hour to an hour and a half. Check if they’re done by piercing them with a knife; if they’re tender, take them out of the oven and let them cool before peeling. 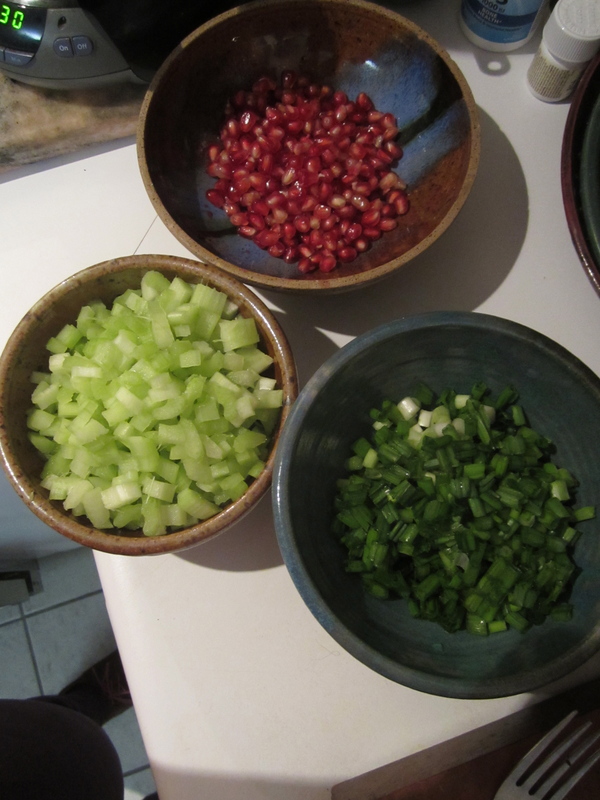 Celery wasn’t part of the plan, but there were three stalks left in the fridge – peeled, chopped, and away we go. Three bunches of scallions went into this, rinsed and chopped. I used the seeds of one pomegranate and about a fistful of dried cranberries. Cilantro (fresh coriander) went in – a bit more than half a bunch. 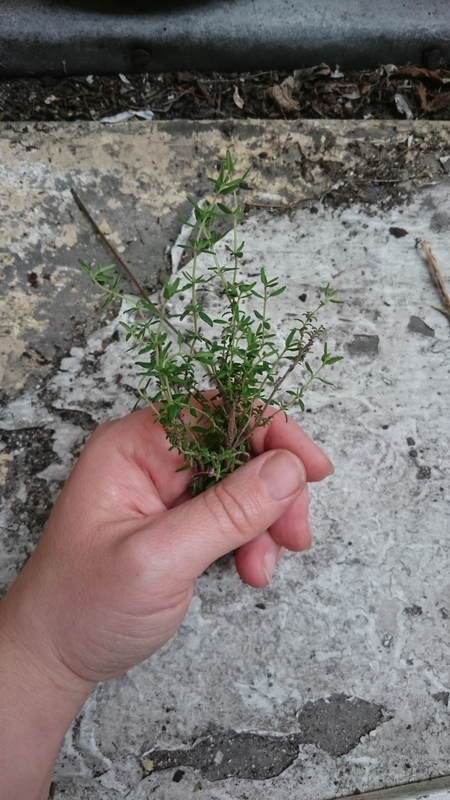 There was fresh mint in the garden, too, so we added a handful. The autumn tabbouleh needs a bit of texture. In Paris I usually default to chopped hazlenuts or walnuts, but here in the American middle south, I felt inspired by the pepitas (pumpkin seeds) at the food cooperative. This is where things get really approximate. I always make the vinaigrette in a jar on the side, first. I used the juice of two lemons, a splashing of cider vinegar, a heaping tablespoon of mustard (one kind or two? 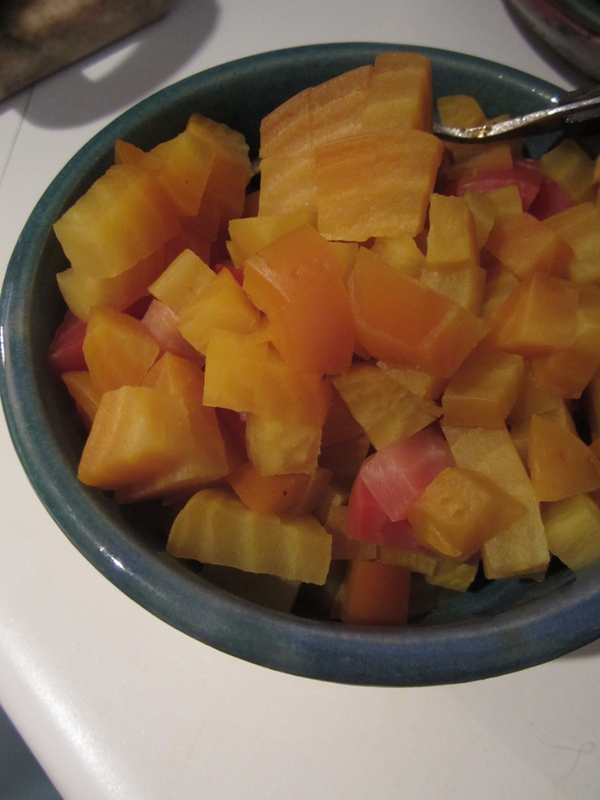 ), salt, pepper, and a mixture of vegetable and olive oil. Lid on, shaken up, and then gently combined into the large salad bowl. You can use bulgur, couscous, quinoa – even rice (but then I don’t think you could really call it a tabbouleh…) I generally allot for 60-80 grams of grains per portion. Cook according to package instructions!